Last week we asked about cool church promotional ideas, and while Chipotle is always tasty, nothing beats simply walking the walk. It’s hardly a promotional idea so it’s kind of cheating, but it does underscore our constant refrain that Christians who do what they’re supposed to do are the best marketing ever. 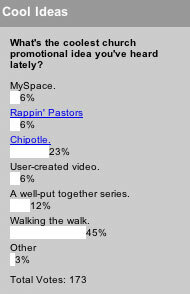 For the record, Chipotle pulled in 23%, a well-put together series had 12%, and MySpace, user-created video and rappin’ pastors all had 6%. This week we ask if your church is innovative, going along with our current series.